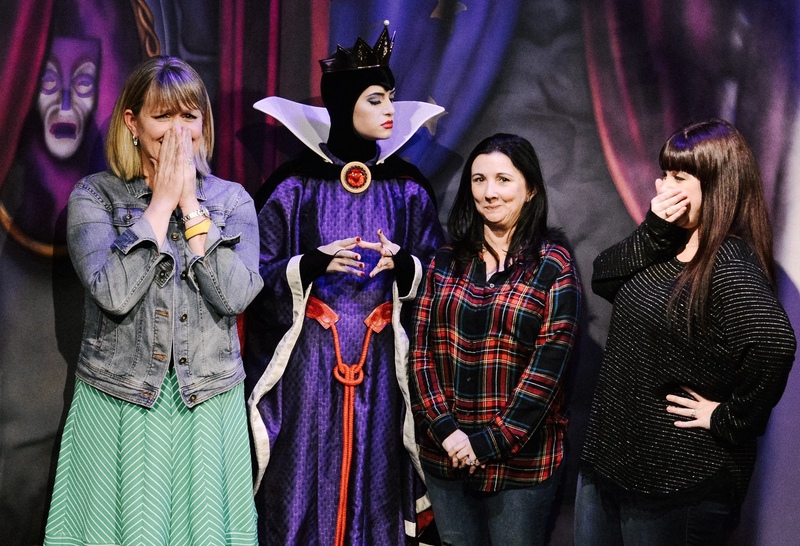 Disney World’s newest character meal seats you with Snow White and the Evil Queen for an enchanting experience! 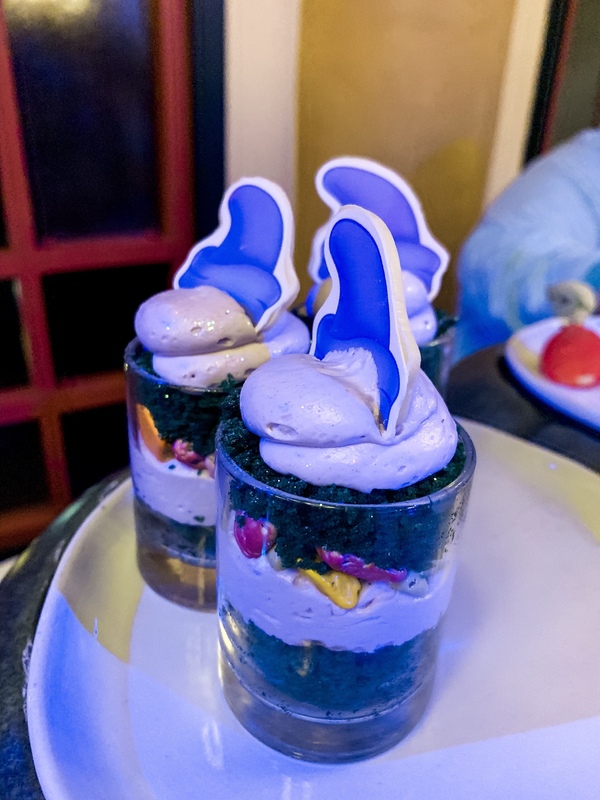 Unlike most character dining experiences at Disney World, Storybook Dining with Snow White is not a buffet and more of a plated family style meal where you’ll get to try a little bit of everything! You can dine at Storybook Dining with Snow White, the Evil Queen and a few of Snow Whites 7 Dwarfs nightly from 4 pm to 9 pm. Reservations are required and should be made up to 180 days in advance on your My Disney Experience account or by calling 407-WDW-DINE. I would suggest you make your reservations at 180 days prior if possible. 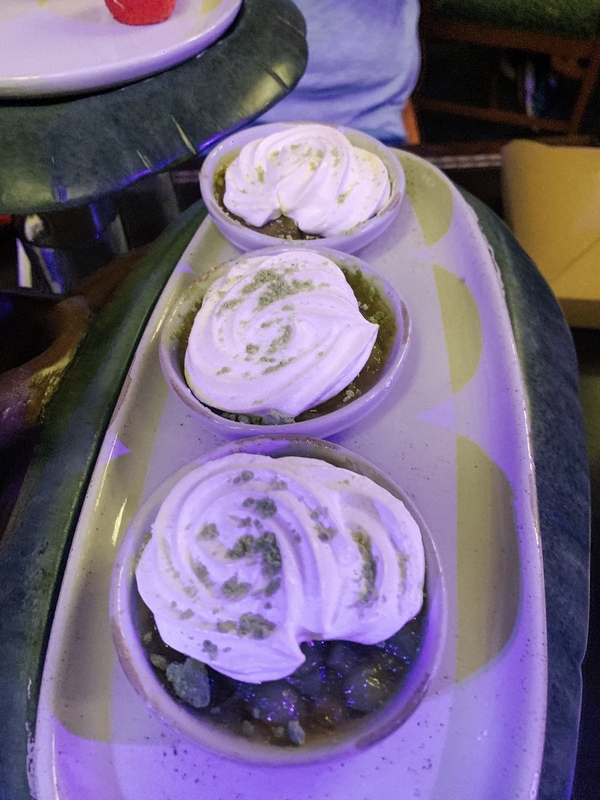 Because this is a new dining experience and features characters that are otherwise difficult to see, it’s very popular and can be difficult to get. 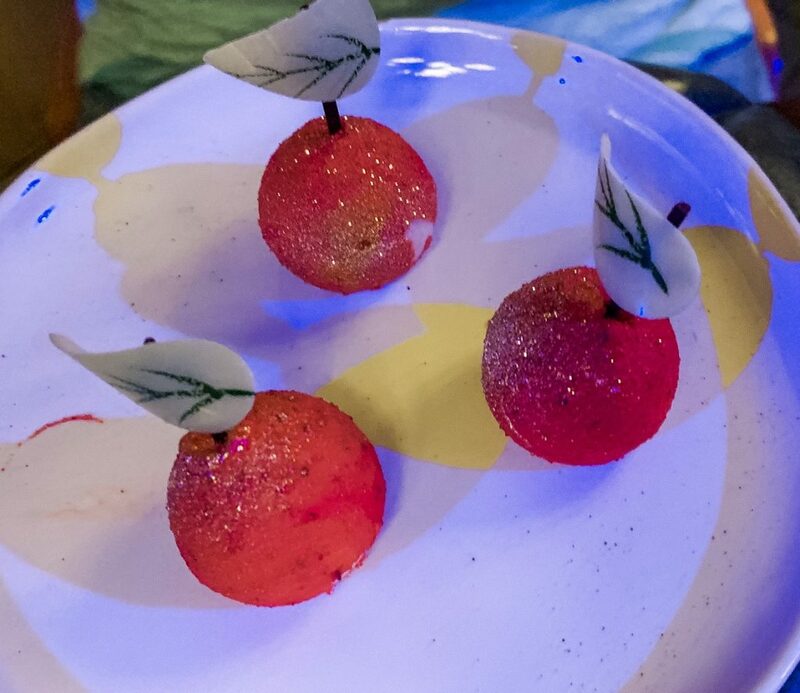 Book your reservation at Storybook Dining with Snow White a 180 days prior to arrival when dining reservations open. Be flexible in your dining time. Keep in mind everyone wants to eat dinner at “dinner time”. However, often times, when you’re staying and playing at Disney, your schedule is different than normal. 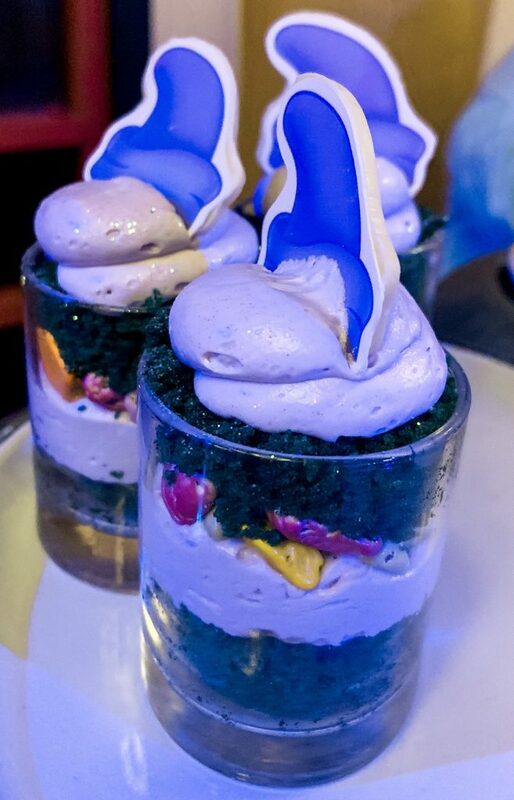 Eat when the reservations are available and enjoy some of Disney’s great snacks in between! Keep trying! Often times reservations will open closer to your arrival date when other guests are cleaning up their held reservations and making decisions on what they really want to experience. Split your party. It can be hard to seat a large party together due to the number of large tables available. If you’ll split your party into smaller groups and have the arrival times close together or slightly overlapping you can often find seating. It’s best to call 407-WDW-DINE and ask them to help you with this. You will need to ask them to split up your party to search for availability. Think in 2’s. It has been my experience that Disney doesn’t want to give up a table of 2 for only one person. They would rather fill the seat. Search in twos to see if that changes availability. While this is not guaranteed to work it does sometimes populate tables that I don’t see when searching in odd numbers. This restaurant is not very large so that limits the number of guests that can be accommodated. 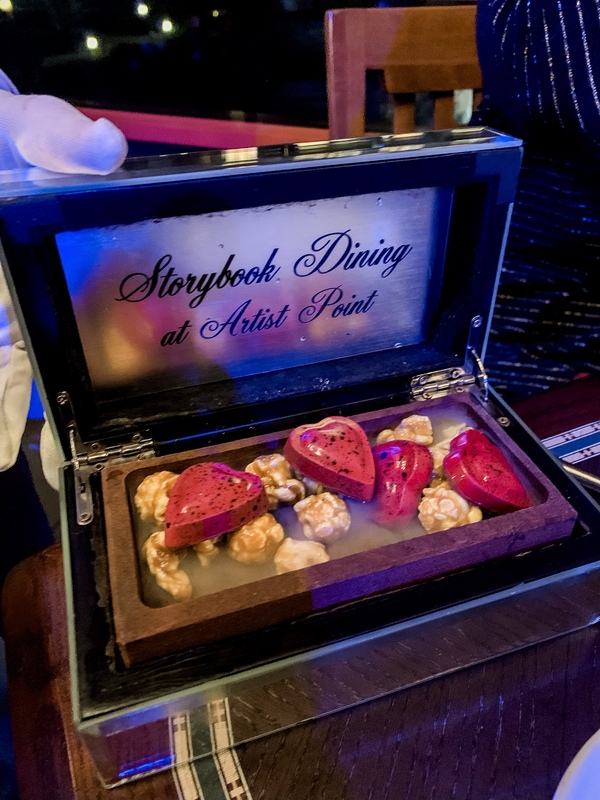 Storybook Dining with Snow White is at Wilderness Lodge Resort in the Artist Point Restaurant. This is not a new restaurant. Artist Point itself has been around since the opening of the Wilderness Lodge but has been reimagined to draw more guests to the restaurant. Most guests come to Wilderness Lodge to eat at Whispering Canyon Cafe. 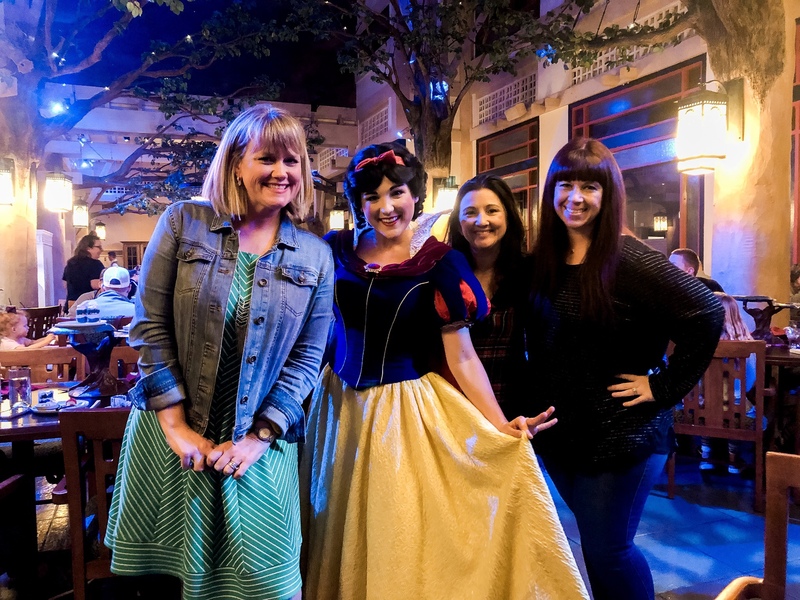 With the addition of Snow White and the Evil Queen to Artist Point, the restaurant has seen a rise in popularity. Wilderness Lodge is located in the Magic Kingdom resort area on Bay Lake in between Disney’s Contemporary and Fort Wilderness. Getting from one resort to another at Disney World can be somewhat difficult and time-consuming. To do so you’ll need to take a resort bus to one of Disney’s four parks. For Wilderness Lodge, I would take a bus (monorail or boat if that’s an option are preferable) to the Magic Kingdom and then ride the boat to Wilderness Lodge. This will easily take you an hour or more to get from one resort to another. For a much easier and time-saving option, I would use a Minnie Van. Minnie Van’s are essentially Disney’s Uber or Lyft system. You can access Minnie Vans from the Lyft app while at Disney World. It’s a flat rate to go anywhere at Disney World. They also will take you to and from the airport. 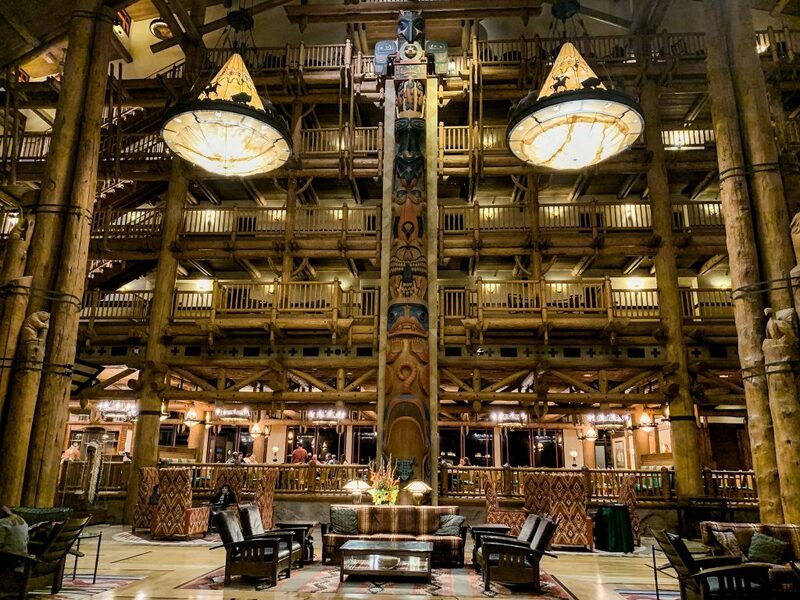 Once you arrive at Wilderness Lodge you’ll check in at the podium at the bottom of the ramp to Artist Point. If you arrive early, consider having drinks at the Territory Lounge next to Artist Point while you wait. Snow White, Dopey and Grumpy make their way around the dining room stopping at each table individually. The Evil Queen stands at the front of the room glaring at you while you eat. It’s bizarre. She arrives closer to dessert time and guests are then able to have their picture taken with her. 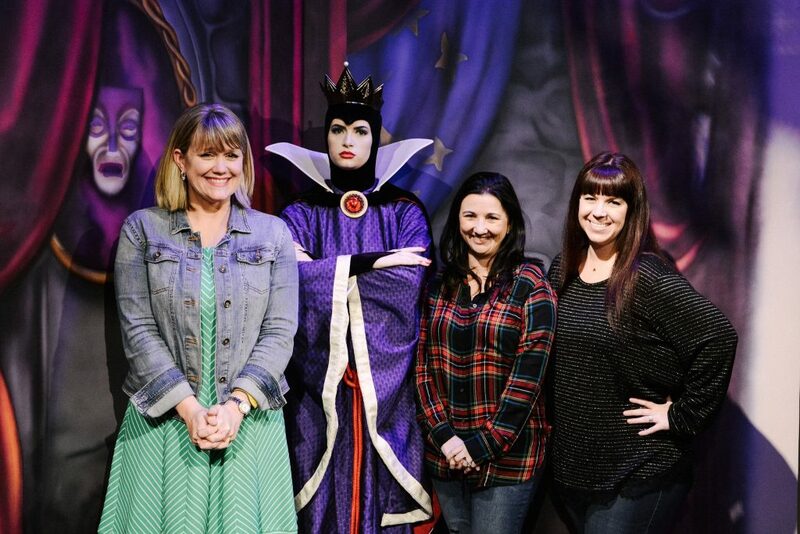 There is a PhotoPass photographer for your picture with the Evil Queen only. For the other characters, you’ll need to take your picture with your own camera or phone. Don’t think you can out evil the Evil Queen. It will result in pictures like this and her letting you know just how “tiny” you really are! 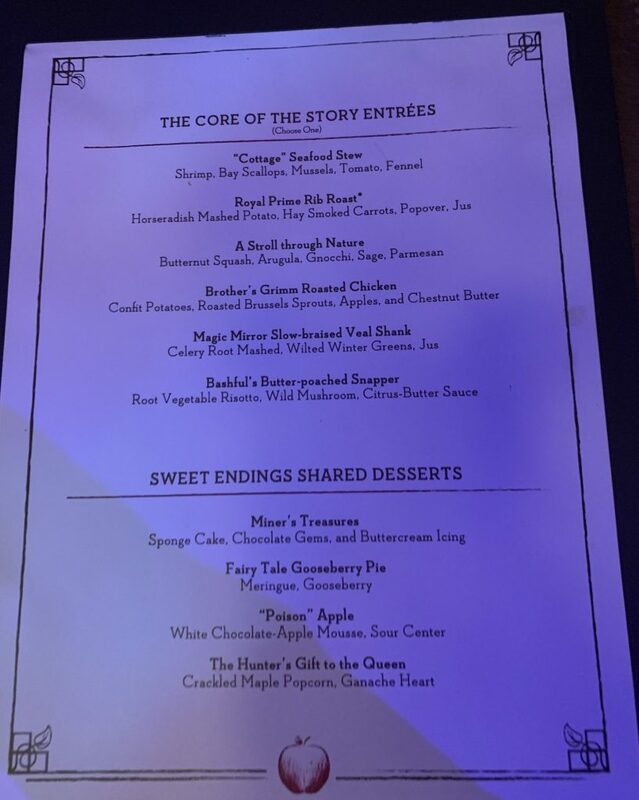 Keep in mind that the only character guaranteed to be at any character dining experience is the one listed in the name of the experience. All other characters are subject to change. In this instance, Snow White is the only character listed but I’d be shocked if the Evil Queen wasn’t there. 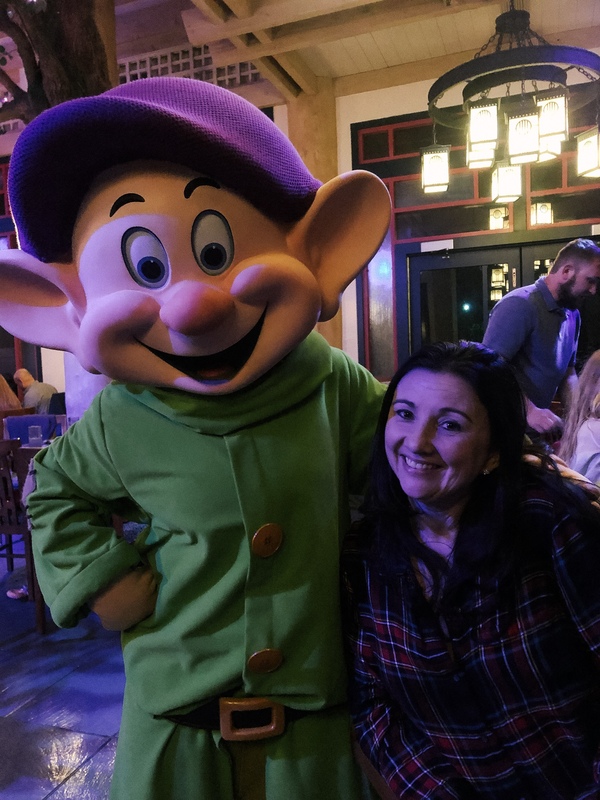 Typically four characters are at each character meal at Disney World. While there are no guarantees to this and it does vary by restaurant, this has been what I experience at most of the character dining I’ve done. 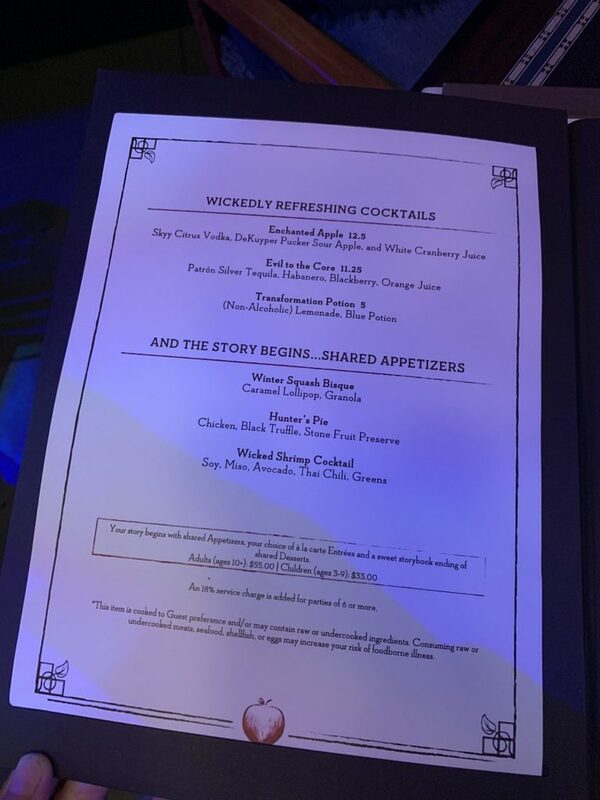 The menu at Storybook Dining with Snow White is very interesting and bit different than what you’ll experience at other dining locations around Disney World. Each guest will be given an appetizer, entree, and dessert but the only parts you choose individually are the entree. 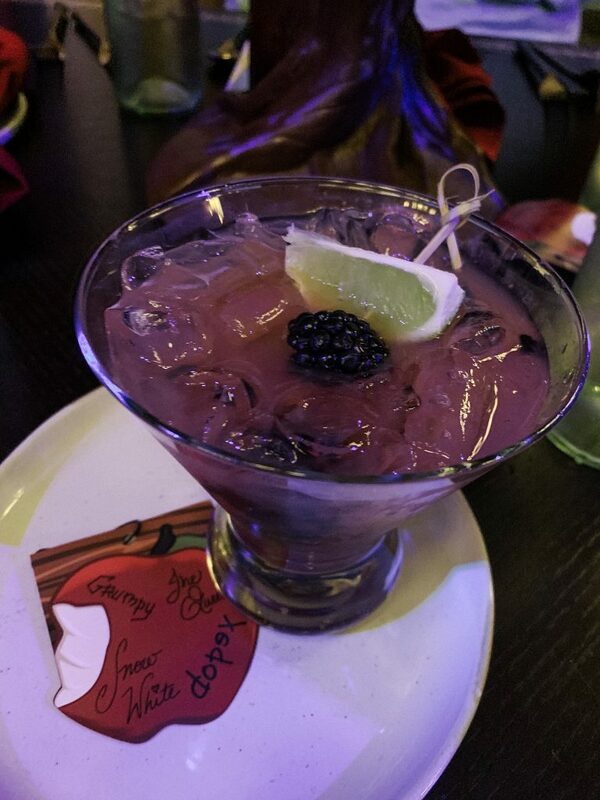 You’ll start with Wickedly Refreshing Cocktails or a drink of your choice and appetizers. I recommend the Evil to the Core, shown here. It was amazing! 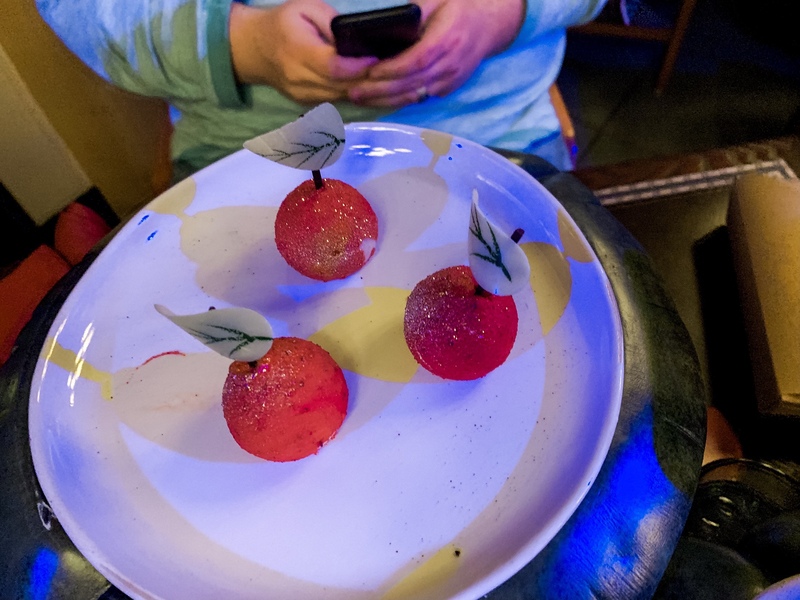 After your drinks have been ordered your waiter will deliver three appetizer options to the table and place them on the forest themed lazy susan. There will be one of each item for everyone at the table to try. The Winter Squash Bisque with a Carmel Lolipop was really good with a spicy flavor. The lollipop is sadly not gluten-free. 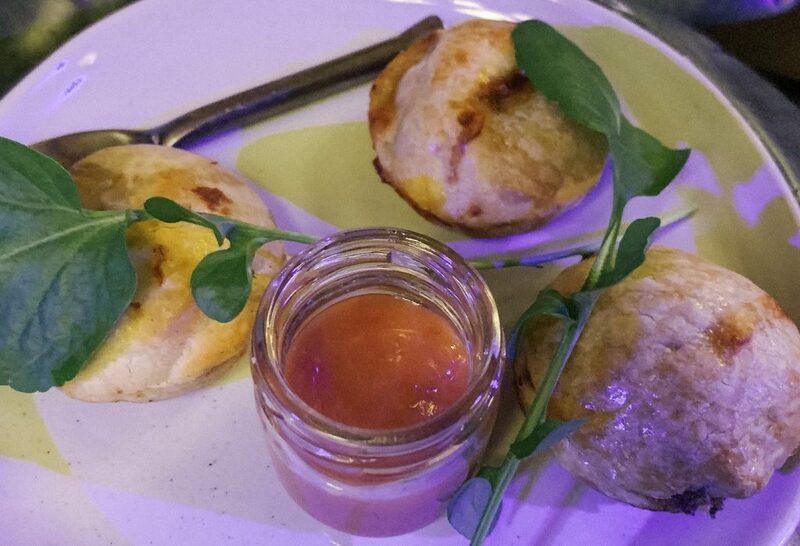 Hunters Pie – not gluten free, but they served a different version to me. Shown below. The Wicked Shrimp cocktail is not shown. 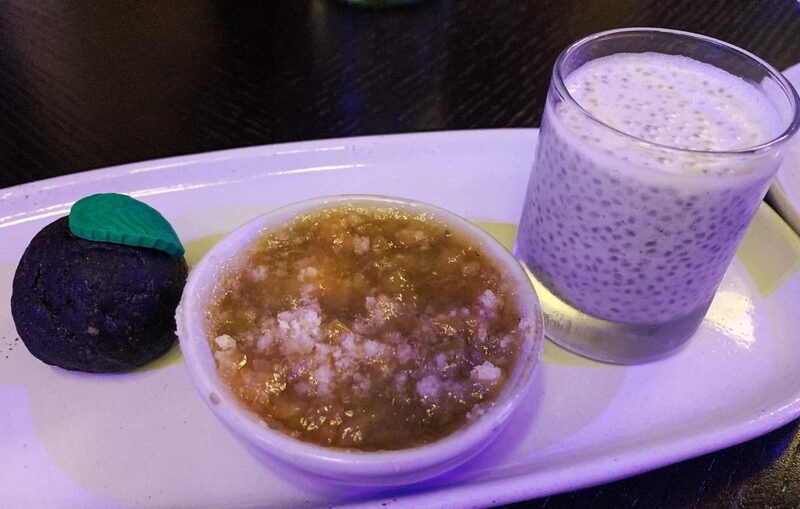 It was served in a jar. I don’t quite get it, but it was good. Each person at the table will select from the six entree items. I chose the chicken. It was the only option, besides the Snapper that was gluten-free but it would have most likely been my choice regardless. Fairytale Gooseberry Pie – It’s tart and interesting. Not bad but I didn’t love it. Your meal will end with this final treat presented to you. “The Hunter’s Gift to the Queen”. 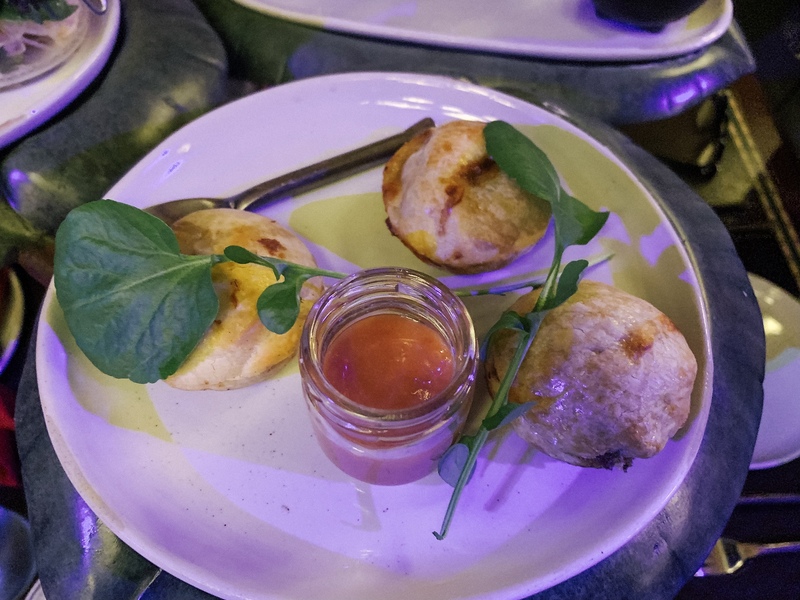 Even though the appetizers and desserts are small bites, the entree servings are quite large. You’ll have plenty to eat and may even have leftovers! 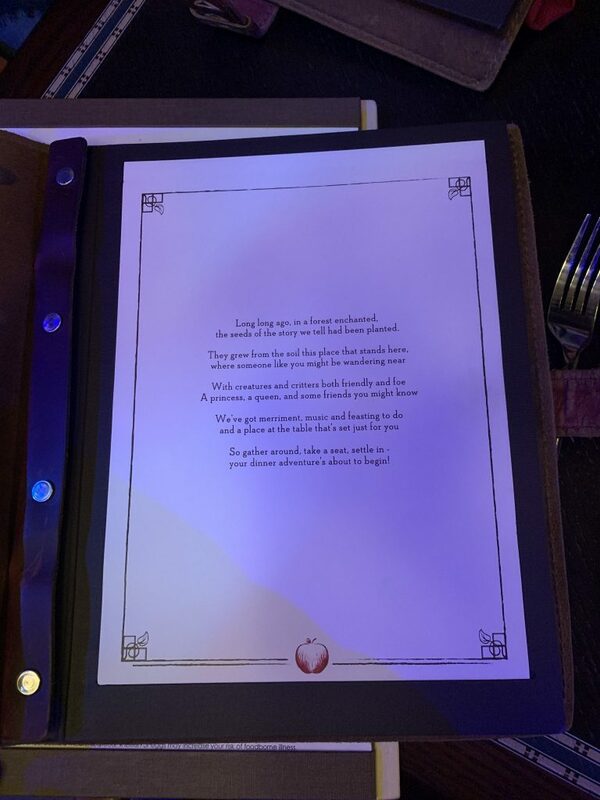 I will say that the menu itself has a different type of taste to it. If you’re not excited about trying new foods, you may not love the food. 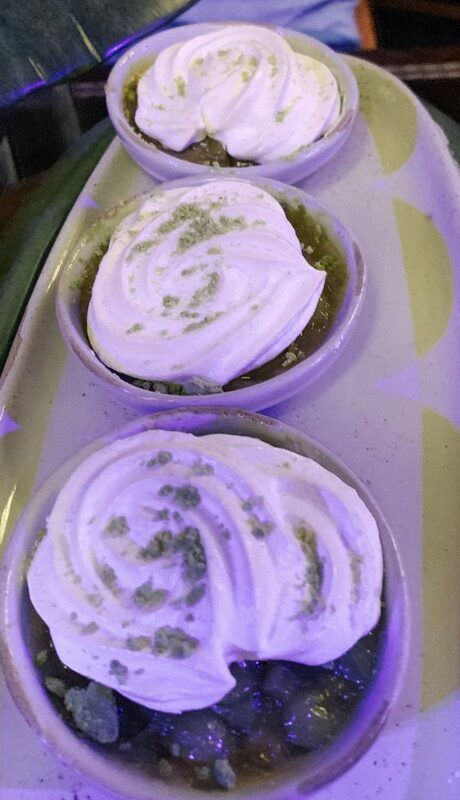 I think I would best describe it as a woodsy flavor with some spice and tartness to the desserts like a sour apple. I’m not even really sure that describes it correctly, I’m no foodie. Let’s just say it was different, but different in a good way. No one at my table was disappointed with their meal. 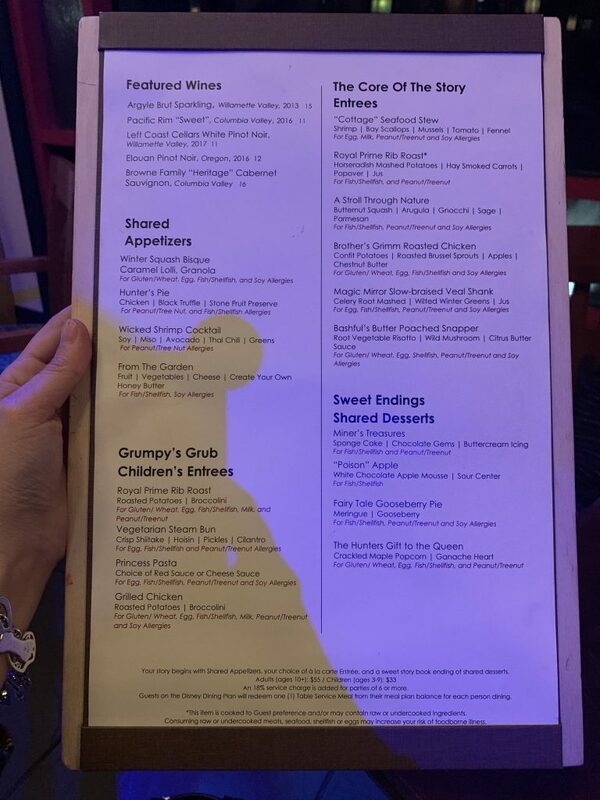 As with most dining options at Disney World, the allergy menu was pretty extensive and offered plenty of good choices. The food was good and I was satisfied with my meal. 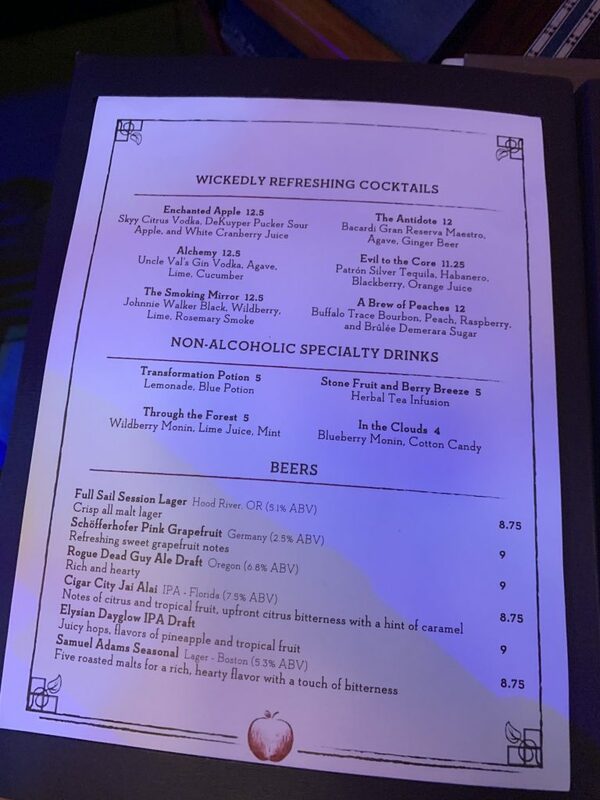 When reading an allergy menu at Disney World it’s different than most places. Disney lists what you can eat bay saying “FOR” and then listing the allergy. So for me, I look for all items that list “Wheat/Gluten”. It can be confusing at first but it actually works quite well to just scan and look for my allergen under each item. All allergy items are served separately from the shared plates in order to avoid any cross-contamination. Disney is excellent with food allergies and takes them very seriously. 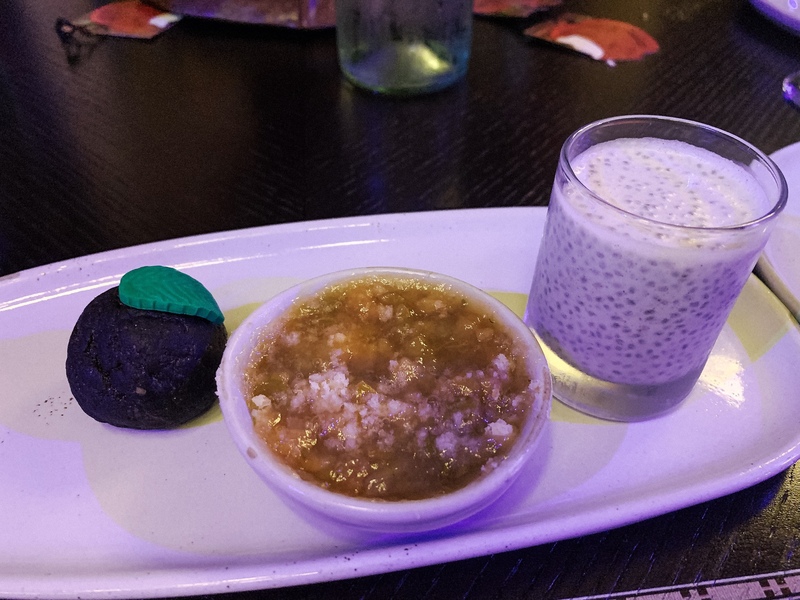 I was surprised when the waiter showed up with something for each of the three appetizers. You’ll notice on the menu that it doesn’t list wheat/gluten for the Hunters Pie. Instead of just eliminating it from my plate, they served an alternative. It looked like a falafel but it wasn’t. (shown on the left of the plate). I don’t know what it was but it was pretty good. In the middle is my soup. It’s the same as everyone else’s except the lollipop has been eliminated. On the right is my shrimp cocktail. It was simply a piece of shrimp without the cocktail sauce. I dipped it in the soup. All was good. My allergy dessert plate was similar to the shared plates. The left is the alternative for the poison apple. It was a dense chocolate cake ball of sorts. The middle is the Fairytale Gooseberry Pie that has been alternate to be gluten-free and the right is the replacement for the Miners Treasure. I have no idea but it was weird. It wasn’t bad but it wasn’t good either. 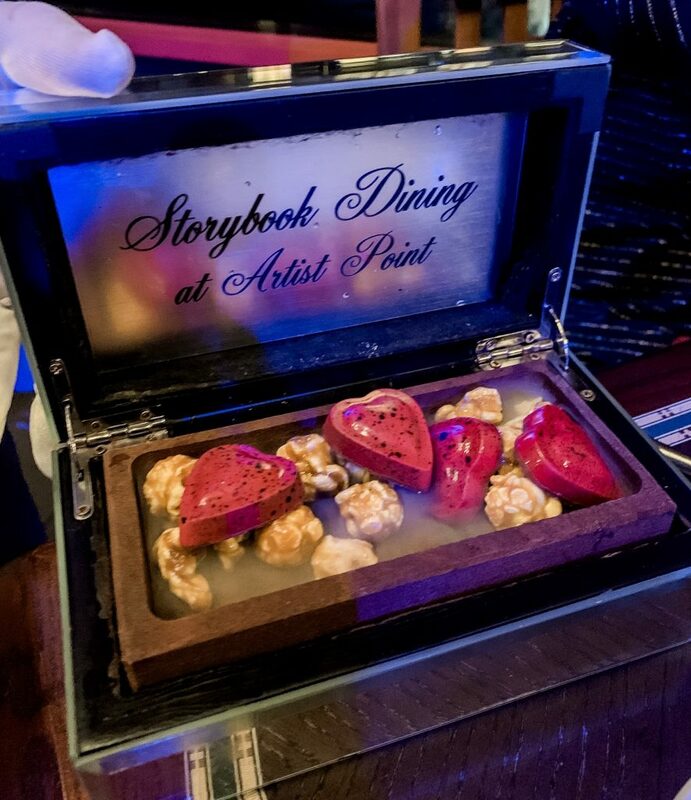 Dining Plans are accepted at Storybook Dining at Artist Point. 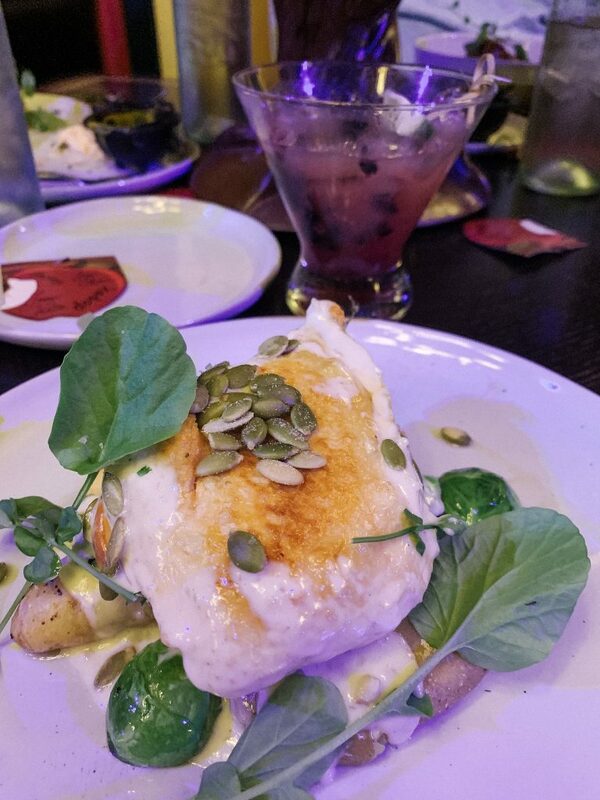 This is considered a Signature Dining experience and will take 2 Table Service Credits per guest. 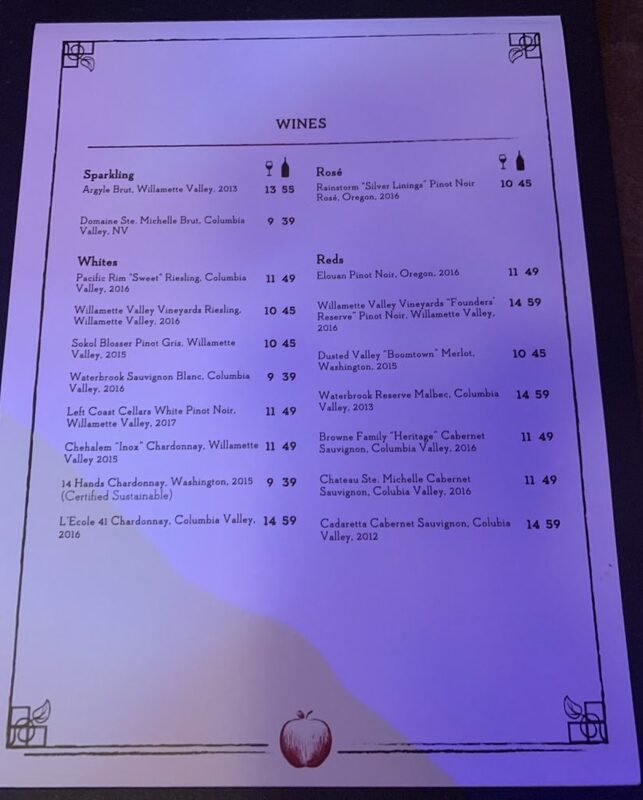 When deciding where to spend your Table Service credits if you have more dining reservations than credits available I would consider a couple of things. If you’re only short one or two credits use your credits for more expensive meals like character dining. This is typically a good value. Payout of pocket for less expensive meals like the ones that don’t charge you a set price just for walking in the door. If you are short more than 3 or 4 Table Service Credits consider upgrading your dining plan to the Deluxe Dining Plan. This lets you use all of your credits interchangeable between Table Serice and Quick Service locations. 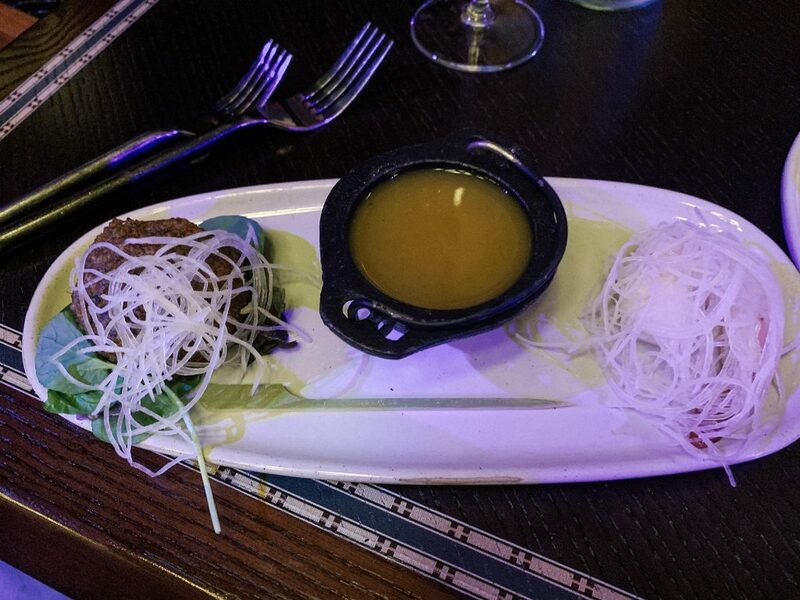 This offers more flexibility in where you’re eating. However, if you’re spending the majority of your dining credits on quick service meals you are most likely not getting a good value for that dining credit. Dining plans can be modified or changed up until 3 days prior to arrival. 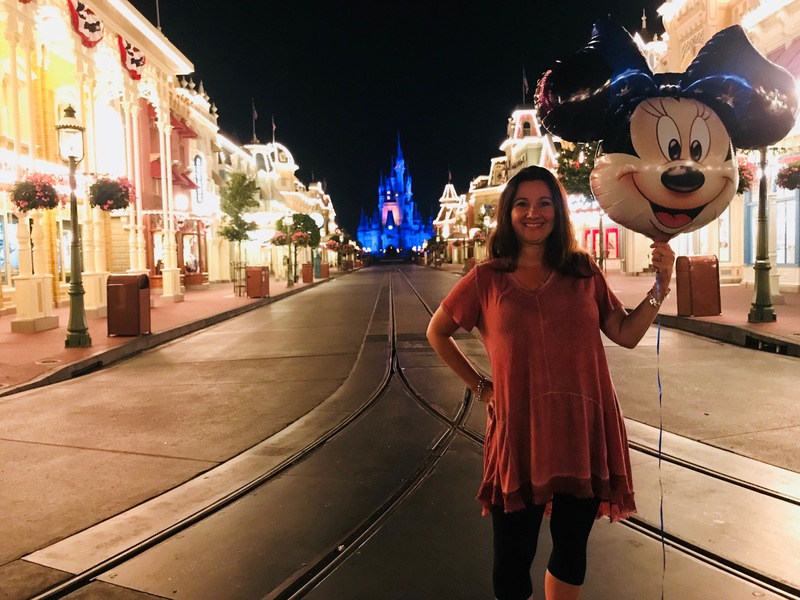 However, when you’ve paid for your vacation package in full at 30 days prior to arrival you can NOT take away the dining plan or reduce the plan you’ve chosen. 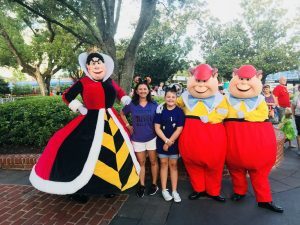 (Deluxe Dining, Disney Dining, Quick Service Dining Plans). Think of it this way, Disney will always take your money or upgrade your vacation experience, 9 times out of 10 you can not choose less of an experience after final payment. Do also keep in mind that gratuities are NOT included with your Dining Plan. You’ll need to budget for those. It is standard practice to tip 20% on your bill just like anywhere else you would dine. All in all, this was a great character meal offering something a little different from most character meals. 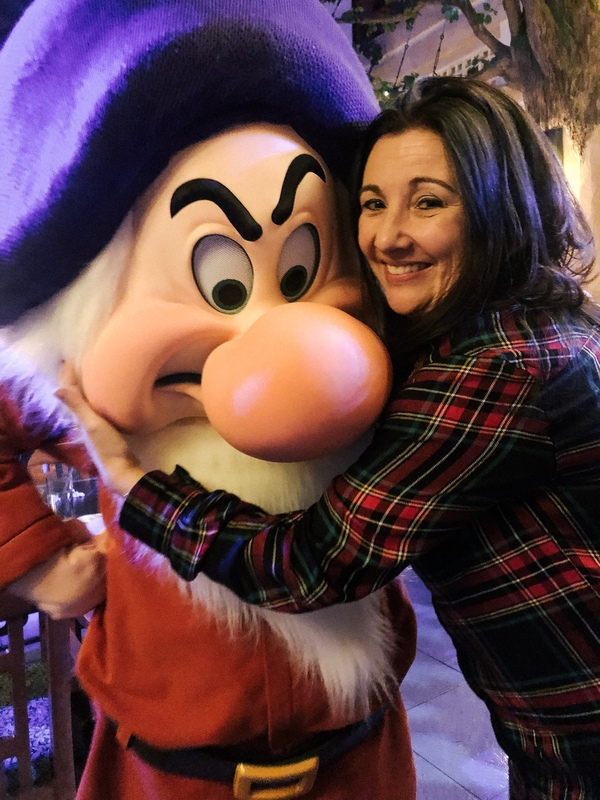 I would recommend you give it a try if you love Snow White, the Seven Dwarfs and the Disney Villians!